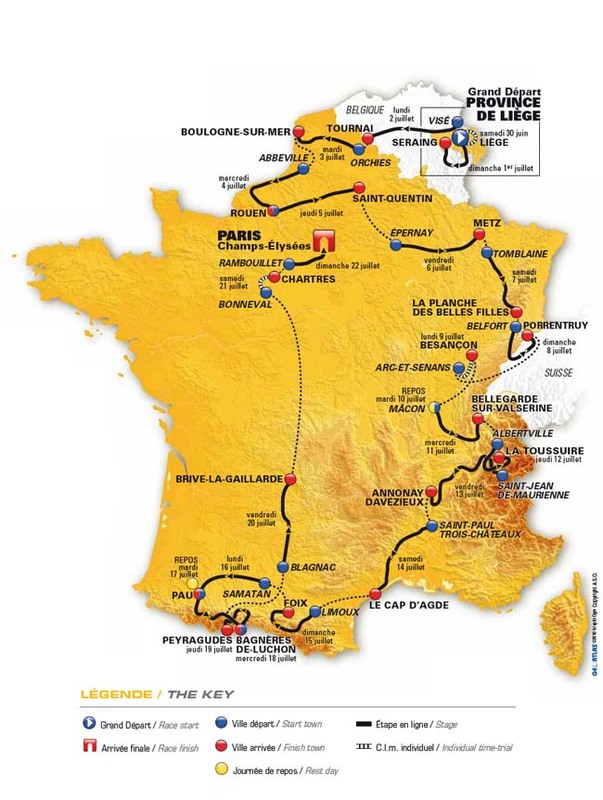 Race organizer ASO officially unveiled the route for the 2012 Tour de France today in Paris. The 99th edition of the Tour starts in Belgium and includes a prologue time trial plus two individual time trial stages, as it traces a counterclockwise route. Significantly, it has only three mountain top finishes, which will favour riders such as defending champion Cadel Evans, but offer little joy to the Schleck brothers (Andy and Frank). The first three stages will take place in Belgium, including the 6.1 kilometre Prologue in Liège. While there are no true mountains, riders will face some of the tough rolling climbs that they see in the Spring Classics. Stage seven is the first real climbing stage, and stage nine the first time trial of 38 kilometres. Stage ten is another climbing stage, but the first real test is the following day, which includes the Col de la Madelaine and Col de la Croix de Fer. The last big test for the climbers will be stages 16 and 17, when the peloton faces the Col de Aubisque, Col de Tourmalet, Col de Aspin and Col de la Peyresourde on the first day and a mountain top finish at Peyragudes on the next. The following day is flat for the sprinters (who are left) and then comes the the penultimate stage, which will be a 52 kilometre time trial that will determine the final podium before the traditional procession into Paris. In total, there are a Prologue, nine flat stages, four medium mountain stages (one summit finish), five mountain stages (two summit finishes) and two individual time trials.